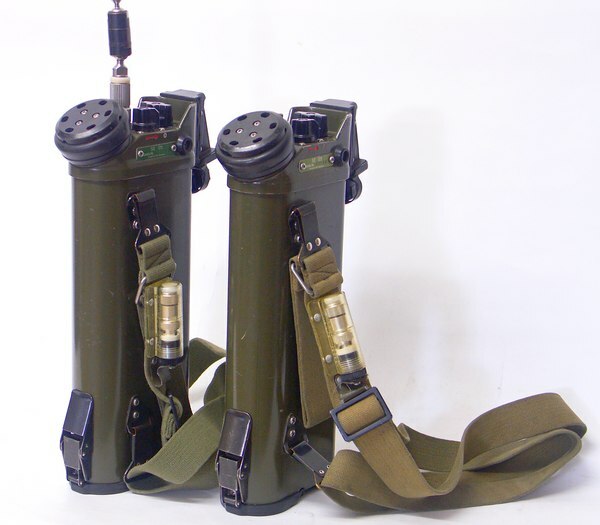 In 1969, a new "Walkie Talkie" has been introduced as standard handheld transceiver in the Swiss Army: the SE-125 developed by Autophon AG, Solothurn. The solid state set exists in six variants: they all have three channels 6, 7, 8 in common, the channels 1 - 5 operate on different frequencies according to the set variant; they can be recognized by the color of the typeplate. The SE-125 has been replaced by the SE-135, it has still been used by Swiss Civil Protection after 2000. The set has a typical rounded meta case, the combined microphone / speaker (the so-called monophone) is in an inclined position at the front of the top face of the set, at the rear the push-to-talk button and the few other controls in between. The dimensions of the SE-125 are 287 x 142 x 57 mm, it's weight with the battery 2,4 kg; it can be carried with a canves strap and has a flexible(often bended) wire antenna screwed on the socket at the top face of the set. Usually, the SE-125 is powered by a special cylindrical 7,5V battery, as an alternative special 6V NiCd accumulators could be used - the batteries are inserted in a compartment covered by a lid at the bottom face of the set. At the front and of the top face of the SE-125, You find the "monophone", it's a combination of a mikrophone and a small speaker and looks like the microphone part of an old fashioned telephone handset. Just behind it, there is the three position power switch: = stands for "Off", big dot stands for "On", small dot stands for "On with squelch activated". The BNC antenna socket is located next to it. The rotary control is the channel selector, channels 6, 7 and 8 eight are the common channels found on all SE-125 variants, the frequencies of channels x1 - x5 are different according to the colour of the type plate - on these channels, only the SE-125 with the same colour type plate can communicate. At the rear end, You find the push-to-talk button and underneath the connector for an external handset (called "microtel") or a headset / throat microphone combination to be used in noisy surroundings. A simple antenna that is made of a kind of stiff wire can be connected to the BNC antenna socket, it's top part can be pulled out to give a total length of 1,2 m. After some time of use, these antennas have been bent many times and do not look like new anymore. The same antenna can be connected via a coaxial antenna cable, this arrangement is called "Granbenantenne" (trench antenna), there has also been an external "Fernantenne" (long distance antenna). The SE-125 is extremely easy to operate: insert the battery and mount the antenna, select the desired channel, main switch to "big dot", You should hear a noise. After having made contact with the second set, switch to "little dot", the squelch should be active and should be opened, when the other station is on the air. The "Antenna lamp" is a very useful accessory to control the function of the set: it is screwed instad of the antenna on the antenna socket - the lamp should be lit when You press the "Transmit" button; if it goes out after a few seconds, the batteries are exhausted. The SE-125 is a short distance personal transceiver, under standard conditions, it's operation range is 3 - 5 km, from an optimum hilltop location, You can reach longer distances, as the VHF signal travels in the distance of sight. As I remember, there have been moments when we used the cellular phone to communicate when our SE-125 transceiver's range was too short - the so called SE-079 (SE stands for "transmitter - receiver" and 079 is the prefix of the Swiss nationwide mobile telephone network...). It is forbidden to operate Your SE-125 as it's operation frequencies are just below the FM broadcast band, but it's a nice set to have in the collection.